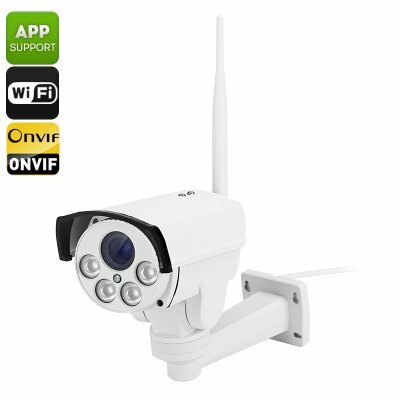 Successfully Added B87W Outdoor IP Camera - 1/2.8 Inch SONY CMOS, PTZ, ONVIF 2.0, IP66, Wi-Fi, Android + iOS Support, 50M Night Vision to your Shopping Cart. When it comes to security only the best will do, with the B87W outdoor wireless IP camera you get excellent surveillance round the clock, and IP66 rating for protection from the elements. The B87W Outdoor IP camera uses a 1/2.8 inch Sony MX 222 CMOS sensor which ensures crystal clear, full HD recordings at 25FPS. This camera has a 2.8 -12 mm zoom lens so lets you get in close on all the details while offering great low light filming that's perfect for round the clock security. So you can have peace of mind that nothing will go unnoticed. You can easily connect to this outdoor IP camera via a wired or wireless connection for greater versatility and easy setup, without worrying about installing reels of cable. With its pan and tilt functions this IP camera can rotate through 300 degrees and tilt up to 60 degrees so its able to cover large areas which would normally require 2, 3 or even 4 fixed cameras. Added to that the 4 times zoom and you have a powerful surveillance tool ideal for covering warehouses, car parks, entranceways and storage yards. The cameras motion detection can be used to cover 4 independent areas and if triggered can send snapshot notifications via email or upload them for you to view anywhere in the world. This can all be done from a Windows computer or even from your smartphone as Android and iOS systems are supported as well. Supporting up to 4 online visitors the footage can be viewed simultaneously making it easy to co-ordinate you security needs. Ensuring 24x7 security is never easy but thanks to the cameras advanced night vision it can deliver detailed images even in the depths of night. This is all due to the 4 IR LED arrays, that bring an incredible 50 meters night vision ability. To keep the camera safe it has an IP66 waterproof rating so you can place it indoors or out. This IP camera has great compatibility and is ONVIF 2.0 compliant so you can easily add it to an existing system or expand your system later with more security cameras and sensors. The B87W Waterproof outdoor IP camera comes with a 12 months warranty, brought to you by the leader in electronic devices as well as wholesale IP cameras and security systems..